The earth's atmosphere is divided into layers. 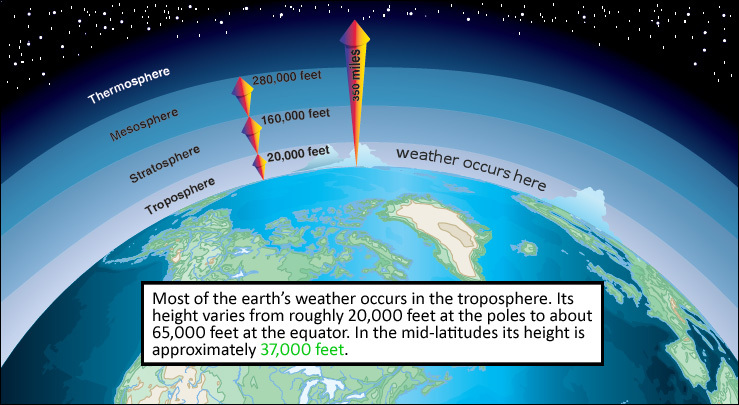 The layer closest to the surface is called the troposphere. The upper boundary of the troposphere is called the tropopause. Crossing the tropopause into the stratosphere results in an abrupt change in the temperature lapse rate. In the stratosphere, changes in temperature with increased altitude are relatively small. According to the FAA's Aviation Weather Advisory Circular, "Jet streams vary in height from 4 to 8 miles and can reach speeds of more than 275 miles per hour (239 knots)." The AIM simply defines a jet stream as "A migrating stream of high-speed winds present at high altitudes." No other references to the speed of a jet stream appears in the FAA standard texts. There is a question, however, whose correct answer is this: "The jet stream is a high altitude current of air with a wind speed of 50 knots and greater." The jet stream is normally weaker and further north in the summer. All weather is the result of a heat exchange. The sun is the major source of heat in the atmosphere. Warm air is less dense than cooler air and tends to rise. Standard temperature at sea level is 15°C or 59°F. The average decrease of temperature (average lapse rate) is 2°C per 1,000 feet. Pressure centers are considered to be high or low. High pressure centers rotate in a clockwise fashion. Low pressure centers rotate in a counter-clockwise direction (think "left" for "L"). This movement is wind. Lines of equal pressure are called isobars. When isobars are close together a steep pressure gradient exists and pilots should expect strong winds. Because of surface friction the winds do not blow exactly parallel to the isobars. An apparent deflection in wind direction due to the rotation of the earth is called the Coriolis Force. An air mass is a body of air that covers an extensive area with uniform properties. A wind change is always associated with the passage of a front. Frontal waves normally form on slow moving cold fronts or stationary fronts. Squall lines most often appear ahead of a cold front. With a warm front, the most critical period for wind shear is before the front passes the airport. Air contains water vapor as a gas. The amount of water vapor is referred to as the relative humidity. When the relative humidity is 100% the air is considered to be saturated and water vapor condenses. Warm air can hold more water vapor than can cooler air. The dew point is the temperature to which air must be cooled to become saturated by the existing water vapor contained. When the temperature and dew point are equal water vapor condenses. Unsaturated air flowing up a slope will cool at the rate of approximately 3°C per 1000 feet (dry adiabatic lapse rate). Temperature inversions are always associated with a stable layer of air. A common type of ground or surface based temperature inversion is that which is produced by ground radiation on clear, cool nights when the wind is light. When a stratus-type cloud exists on the earth's surface it is called fog. Fog may form by cooling the air to its dew point or by adding moisture to the air near the ground. Fog is usually prevalent in industrial areas because of an abundance of condensation nuclei from combustion products. Clouds, fog, or dew will always form when water vapor condenses. "Fog Usually Seems Present After Rain." The first letters stand for the five types of fog. Radiation fog forms when the surface is cooled by radiation. The air close to the surface also becomes cooler. When the air temperature reaches its dew point, fog is formed. Radiation fog forms most commonly in warm, moist air over low, flatland areas on clear, calm nights. Advection fog forms when warm, moist air moves over a colder surface. ("Advection" refers to horizontal movement.) Advection fog is most likely to occur in coastal areas. Upslope fog forms when moist, stable air is pushed up sloping terrain by wind. It is cooled to its dew point and fog results. Frost forms when the temperature of the collecting surface is below the dewpoint of surrounding air and the dewpoint is colder than freezing.